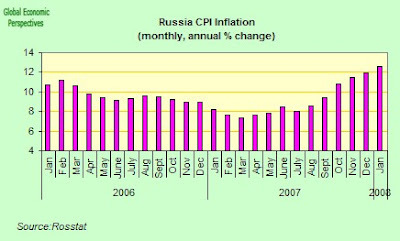 Rosstat, the Russian state statistics service, issued a preliminary financial report on January 2008 yesterday. Economists say that the report indicates that the investment and consumption boom in Russia continues, in spite of the worsening world economic situation. A slight slowdown in retail cam be attributed to the ling holidays that month. 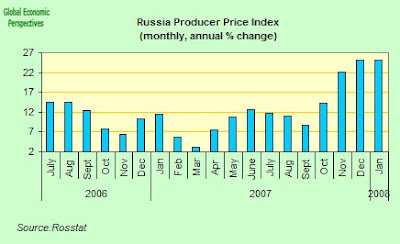 The volume of investment in January 2007 was up 19 percent, to 354.9 billion rubles, in comparison with January 2007. That month last year saw record growth of 26.9 percent over January 2006. January's industrial production was up 4.8 percent over the previous January. Disposal income in January of this year rose 12.9 percent (nominally 28.5 percent) over last January, to 10,641 rubles. Real salaries rose 15.8 percent. These increases are fueling the consumption boom that has seized Russia. Retail turnover in January rose 14.1 percent to 911.6 billion rubles. Foodstuffs made up 45.1 percent of retail trade turnover in January 2008, down from 45.4 percent a year ago. Deputy Minister of Economic development and Trade Andrey Belousov reported yesterday that GDP growth in January was 7.4 percent. While as reported yesterday The index of Russia’s manufacturers’ prices soared 25.2 percent on year in January, RIA Novosti reported the data of Federal Statistics Service. The growth in manufacturers’ prices was twice as much as the increase in consumer prices (12.6 percent). The prices of manufacturers gained 3.7 percent in January vs. December of 2007. In the fuel and energy sector, coal and peat prices jumped 13.4 percent and the prices for crude oil and accompanying gas gained 4.3 percent. At the same time, the decline of 13.2 percent was noted in extraction of non-ferrous metal ores and the prices for certain oil products went down as well. The prices for residual oil, for instance, shed 5.6 percent, petrol prices lost 4.5 percent. When it comes to processing industries, the prices of chemical production were fueled by the 15.5-percent increase in prices for other basic inorganic chemicals, the 12.8-percent growth in prices for fertilizers and nitrogen compounds, the 8.0-percent growth in prices for plant protection chemicals (pesticides) and other agrochemical products and the 6.5-percnet growth in prices for basic chemicals. Meantime the prices of flats in Moscow continue to manifest skyrocketing growth. They surged nearly 10 percent between January to February, Vedomosti reported Thursday, pointing out that the analysts haven’t arrived at some common conclusion yet. The figures are different. Some say the average price for a square meter in Moscow grew by roughly 7.8 percent from January 1, having climbed from $4,438 to $4,783 (the ruble growth was 7.9 percent, from 108,936 rubles to 117,595 rubles). But others speak of the 8,500-ruble increase from January 1, pointing out that, for some flats, the prices stepped up 15 percent in three weeks of February. The increase covered all segments. Economy flats cost 7 percent more now, business class gained 6.7 percent and elite real estate increased 6 percent. The growth was above 15 percent in some parts of Moscow (one-/two-room flats in Zelenograd, South-East and North-West Districts). The one-roomed flats are the obvious leaders with the prices soaring up to 20 percent. An ordinary flat with a room of 35,000 square meters cost $160,000 before the New Year, but the current price is $190,000. Realtors give different reasons for this increase, ranging from the surge in demand and reduction in supply of secondary flats and tougher conditions for mortgage crediting to the general shift of investors from stock markets to the market of real estate. Also the number of economically active Russians reached 75.3 million last year. The employment growth drove the unemployment level down to an unusually low level, and the increase in employment accounted for a roughly a third of economic growth. Russia had 9.4 million unemployed in 1999, 6.2 million in 2003, 5.6 million in 2005 and reached the record low of 4.6 million in 2007. The cost of goods leaving Russian factories and mines rose at a faster pace in January for the fourth consecutive month as global energy and metal prices remained high. Producer prices in the world's biggest energy exporter increased 25.2 percent, the fastest rate in 3 years, from 25.1 percent in December, the Federal Statistics Service said today. Prices rose 1.6 percent in the month, the statistics office said. Capital investment increased an annual 19 percent in January as industrial output expanded 4.8 percent, the statistics office also said. 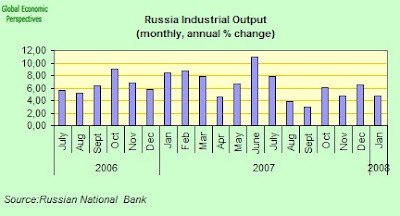 Russian industrial output growth slowed in January to an annual 4.8 percent when compared with January 2007. The result was largely the result of a high "base effect" due the fact that an unusually warm winter in 2006/07 boosted manufacturing output in the same period last year. Growth eased back from a 6.5 percent annual rate in December, according to data released today by the Moscow-based Federal Statistics Service. Growth was running at an annual 8.4 percent rate in January last year. Month on month production fell 14.1 percent, but this is not surprising in view of the impact of weather conditions. In addition Jan. 9 was a public holiday. What is perhaps much more significant than the month by month changes is the long run trend which shows industrial output growing much more slowly than consumer demand. This may well mean that Russia will eventually run a trade deficit, since oil output cannot be raised significantly, at least over the appropriate time horizon, since many observers are predicting that Russia could move into a trade deficit as early as 2010. Indeed, Andrei Klepach, the Economy Ministry's chief forecaster, recently said that he felt Russia's surplus may shrink to $13 billion by 2010 before disappearing completely a year later. Russian inflation accelerated in January to its fastest pace in 30 months as oil and gas prices surged, fueling consumer demand. Consumer prices rose an annual 12.6 percent in January from 11.9 percent in the previous month, the highest since July 2005, the Moscow-based Federal Statistics Service said in an e-mailed statement today. Given the underlying demographic and labour shortage issues it is going to be fascinating to see whether they can get this under control without provoking a hard landing and a major growth slowdown. Russia, the world's biggest energy exporter, is struggling to slow inflation ahead of March 2 presidential elections as revenue from oil and gas sales and global food costs push up prices. Inflation reached an annual 11.9 percent last year, above the percent government target. The central bank announced last week that it would raise its main interest rate from Feb. 4 by a quarter of a percentage point to 6.25 percent and increase reserve requirements but an increase of this order is more likely to increasethe inflow of funds more than it reduces growth. Much stronger measures would be needed, and I am not sure that there is the political will for this. Russian Finance Minister Alexei Kudrin has said last year's record net capital inflow -- a broad measure of the money entering the country -- stoked inflation by swelling money supply. Inflow doubled last year to more than $80 billion, according to the central bank. Retail sales grew 15.2 percent in 2007 while disposable income increased 10.4 percent, according to the Federal Statistics Service. Food prices rose a monthly 1.9 percent, compared with 1.6 percent in December, according to the statistics service. The price growth was led by fruits and vegetables, which rose by 8.3 percent. The price of cabbage jumped 20.3 percent in the month, while the cost of potatoes rose 13.4 percent. In a bid to rein in food prices, the government has cut dairy and vegetable oil import duties, sold grain from state reserves and added a grain export duty. Companies including OAO Wimm-Bill- Dann and X5 Retail Group NV agreed to extend a price freeze on some milk, vegetable oil, egg and bread products until May 1, but most of this becomes virtually laughable when you look at the scale of the problem. Russian service industries including banking, telecommunications and hospitality expanded at the slowest pace in six years in January as new business growth declined and confidence in the global economy fell. 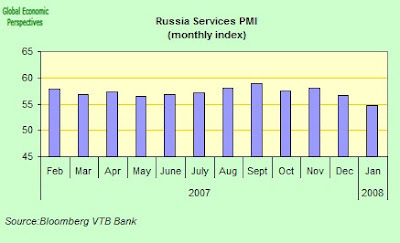 VTB Bank Europe's index of services growth fell to 54.8 in January from 56.6 in December. A figure above 50 indicates expansion so the economy is still expaniding reasonably strongly. What is clear though is that the rate of expansion has slowed. At the present point this is simply one more data reading among others, and it may or may not take on mopre significance as we move forward. In a certain sense, given the inflationary issues which face Russia, this slight reduction in the pace of the expansion might be thought of as welcome news. VTB surveyed 300 purchasing managers at service companies. The index declined for the second month to its ``weakest'' since data were first collected in October 2001. On February 1, 2008, the world saw the official launch of another sovereign wealth fund (SWF), since Russia formally launched its National Welfare Fund (NWF). This fund is likely to become another large and important SWF, even though its birth weight – possibly tipping the scales at US$32 billion or so – is modest relative to China’s CIC. If oil prices remain supported, Russia will likely see this fund grow over time. In five years’ time, the NWF could be anywhere between zero and US$320 billion, depending on how much the budget and the pension fund draw on the NWF. Initially the fund will be probably be managed conservatively, in ways not dramatically different from how official reserves are generally managed in other countries. However, as the NWF gains experience and confidence, it is likely to have a broad portfolio of risky assets, just like the other SWFs. The birth weight of the NWF will be around US$32 billion. On February 1, 2008, the Oil Stabilisation Fund (OSF) – which forms a part of the official reserves, including gold, of US$479 billion – will be tiered into a NWF and a Reserve Fund (RF). The latter will be kept at an amount that is equivalent to around 10% of Russia’s GDP, which is currently around US$1.27 trillion, with the rest being funneled into the NWF. As of end-2007, the OSF was US$156.8 billion. Subtracting out 10% of GDP (US$127 billion), this leaves some US$29 billion for the NWF as of end-2007. By February 1, this figure will have reached around US$32 billion. This is larger than the US$24 billion expected by the Russian government last April. Governance structure. 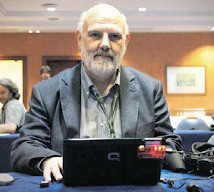 The NWF will be managed by the Ministry of Finance, though some asset management responsibilities may be delegated to the Central Bank of Russia. The MoF has the autonomy to recommend the currency composition and asset allocation of the NWF, subject to government approval. The MoF will publish monthly reports to the media, and will report quarterly and annually to the government on accumulation, investment and spending of the capital of the Fund. The mechanism of fund accumulation. Going forward, all oil tax proceeds (including those from the first US$27 per barrel of Urals oil) will now be saved in the OSF. Further, tax receipts associated with natural gas transactions will also be diverted to the OSF. In addition, the budget can claim resources from both funds (the NWF and the RF), but the total transfer cannot exceed 3.7% of GDP; this cap will be effective in 2010, with the intermediate target being more flexible. A conservative investment style to start out. When the notion of the NWF was first conceived, the intention was to make the Reserve Fund be invested in ‘risk-free’ sovereign bonds (like official reserves) and for the NWF to be invested like a SWF, i.e., in assets with higher expected returns, such as equities. (i) All holdings must be in foreign debt, denominated in USD, EUR or GBP, rated at least AA-, from Austria, Belgium, Canada, Denmark, Finland, France, Germany, Ireland, Luxembourg, the Netherlands, Spain and the US. (ii) At least 50% in foreign government debt, with the rest in foreign private/corporate debt. (iii) Up to 30% in foreign agency debt and central bank debt. (iv) Up to 15% in debt of international financial organisations (ADB, EIB, etc.). (v) Up to 30% in foreign bank deposits. The Ministry of Finance has until October 1, 2008 to propose a framework for wider investments, potentially including corporate debt, equity and investment funds, but actual investment in these assets will be at least another year away. Currently, the OSF is invested in AAA government debt. Jen estimates that the fund could potentially grow to US$600 billion in a decade. The biggest question mark over this is the extent to which there are extraordinary withdrawals from the fund by the Russian government, above and beyond what is permitted under the 3.7% fiscal transfer rule. Jen feels that the likelihood of such extra withdrawals is reasonably high, and I tend to agree with him. The Russian central bank raised its main interest rates by a quarter of a percentage point, with effect from Feb.4, signaling it sees inflation as a bigger threat than concerns about a liquidity squeeze in the nation's money markets. The minimum rate for taking out one-day loans from the central bank in repurchase auctions will be raised to 6.25 percent, the Moscow-based bank said today. The bank will also increase reserve requirements for banks' ruble and foreign currency liabilities to non-resident banks to 5.5 percent on March 1. The move appears to be aimed at discouraging Russian banks from raising their foreign debt levels.